Contest opens September 15th to November 15th, 2018. Prize redeemable at winning Castle location. Good towards products or services. 1. 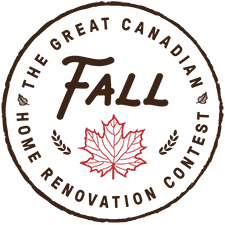 PROMOTIONAL PERIOD: The Castle Building Centres Group Ltd. Great Canadian Fall Home Renovation Contest (the “Contest”) commences at 12:00:01 AM (ET) on Saturday, September 15, 2018 and will end at 11:59:59 PM (ET) on Thursday, November 15, 2018 (the “Promotional Period”). 2. ELIGIBILITY: To enter and be eligible to win the Prize (defined in Rule 5 below) an entrant must be at the time of entry (a) an individual legal resident of Canada; (b) located in Canada; (c) of the age of majority in his/her province or territory of residence. Employees, officers, and directors including immediate family members (a person’s parents, spouses, siblings and children and members of the same household of such persons, including common law spouses) of CASTLE BUILDING CENTRES GROUP Ltd. (the “Sponsor”) and its Member Locations, their employees, its affiliated companies or agents, their respective advertising or promotional agencies, and the independent contest organization are not eligible to enter the Promotion. Children under the age of thirteen (13) in the province of Quebec are not eligible to participate. 3. HOW TO ENTER: No Purchase is Necessary. For a complete list of participating Castle stores visit www.castle.ca/renocontest. All entries must be received by 11:59:59 PM (ET) on Thursday, November 15, 2018 to be eligible to win. In-Store: To enter the Contest in-store, (each herein defined as an “Entry”): Complete the Entry Form in its entirety with your first and last name, email address, city, province, postal code, home and cell phone numbers, the name of the store where the contest entry code was obtained and deposit it in the ballot box provided at any participating Castle Building Centers location. Online: To enter the online Contest, a participant must first pick up a contest code in-store at any participating Castle Building Centres location. Register online at www.castle.ca/renocontest. Complete the online Entry form in its entirety with your first and last name, e-mail address, city, province, postal code, home and cell phone numbers, name of the store where entry code was obtained and the contest code. 4. ENTRIES: Limit of one (1) contest entry per contest code during the Promotion Period. Any attempt by an entrant to obtain more than the stated number of entries by using multiple/different names, email addresses, identities, registrations, contest codes or any other methods will void that persons entry and eligibility to win a Prize, and the entrant will be disqualified from the contest. The Sponsor will not be responsible for late, lost, illegible, falsified, damaged, misdirected, mutilated, garbled or incomplete Entries, which will be void. Entries will not be returned. The odds of winning depend on the total number of eligible Entries received. 6. DRAW. The three potential Prize Winners will be selected by random draw from all eligible entries received by region by the contest closing date of Thursday, November 15, 2018. The draw will take place on Tuesday, December 4, 2018 at 1:00 PM ET at the offices of Espress Labs Inc. 8-595 Cityview Blvd. Woodbridge ON L4H 3M7. The selected entrants will be contacted by phone or e-mail by KCG Marketing Services within five (5) business days after the draw date. To be declared a Prize Winner, the selected entrant must sign and return the Release Form as described below within the stated time period. In the event that a selected entrant is disqualified from eligibility, cannot be contacted within five (5) business days after selection, or does not return the signed Release Form within the stated time period, another potential Prize Winner will be selected and the Sponsor shall be fully and completely released from any liability or responsibility to the first selected entrant. The above process will be repeated until one (1) entrant per region is confirmed the “Winner”. Decisions of the judges in relation to Prize Winner selection and in all other matters relating to this Contest shall be final and binding. 7. RELEASE FORM: To be declared a Prize Winner, the selected entrants must correctly answer the skill testing question and complete and return the Release Form provided, confirming that he/she abided by these Official Rules including eligibility requirements, acknowledging that the Prize must be accepted as awarded and cannot be substituted or transferred, releasing the Sponsor from responsibility for any claims or damages arising out of any matter related to the Contest or the Prize, and authorizing the Sponsor to broadcast, publish and disseminate his or her name, address (city only & province), photograph, likeness and voice without further remuneration, in connection with any promotion or publicity carried out by or on behalf of the Sponsor in connection with this Contest, and granting a copyright license and a waiver of any moral rights to this effect. The Release Form must be completed and returned within five (5) days of receipt. Following receipt of the fully completed Release Form and confirmation of eligibility pursuant to these Official Rules, the Sponsor or a designated agent will contact the Prize Winner to make arrangements to fulfill their prize. 8. CONDITIONS OF ENTRY: By entering the Contest, you (i) acknowledge compliance with these Official Rules including all eligibility requirements, and (ii) agree to be bound by the Official Rules and by the decisions of the Sponsor and the independent contest organization, made in their sole discretion, which shall be final and binding in all matters relating to this Contest. Entrants who have not complied with these Official Rules are subject to disqualification. If a dispute arises regarding who submitted an Entry, the Entry will be deemed to have been submitted by the authorized account holder of the email address provided at the time of entry. The authorized account holder is defined as the natural person who is assigned an e-mail address by an Internet access provider, on-line service provider, or other organization responsible for assigning e-mail addresses for the domain associated with the submitted e-mail address. 9. GENERAL: The Sponsor and the independent contest organization do not assume any responsibility for (i) the incorrect, incomplete or inaccurate capture of Entry information and Entries that fail to comply with the Official Rules; (ii) any loss, damage, or claims caused by an awarded Prize or the Contest itself; or (iii) any failure of the website during the Promotional Period, including any problems, human or technical, printing errors, lost, delayed, garbled data or transmissions, omissions, interruptions, deletions, defects or failures of any telephone or computer lines, or technical malfunction of any computer on-line systems, servers, access providers, computer equipment, software, failure of any e-mail or Entry to be received on account of technical problems or traffic congestion or time-out on the Internet or at any website, or any combination thereof including any injury or damage to an entrant’s or any other person’s computer related to or resulting from downloading any material connected to the Contest, all of which may affect a person’s ability to participate in the Contest. Entry material/data that has been tampered with or altered is void. All issues and questions concerning the construction, validity, interpretation, and enforceability of the Official Rules, or the rights and obligations of Prize claimants and the Sponsor in connection with the Contest, shall be governed by, and construed in accordance with (i) the laws of the Province of Québec and the laws of Canada applicable therein only in respect of entrants who are residents of the Province of Québec, and (ii) the laws of the Province of Ontario and the laws of Canada applicable therein in respect of all entrants who are residents of any of the other Canadian provinces/territories, without regard to conflicts of law principles. Any attempt by a participant or any other individual to deliberately damage any website or undermine the legitimate operation of the Contest could be a violation of criminal and civil laws and should such an attempt be made, the Sponsor reserves the right to seek damages from any such person to the fullest extent permitted by law. This Contest is subject to all Federal, Provincial, and Municipal laws. The Sponsor reserves the right, with the consent of the Régie des alcools, des courses et des jeux, to terminate or suspend the Contest or to amend the Official Rules at any time and in any way, without prior notice, for any reason whatsoever. The Sponsor reserves the right, with the consent of the Régie des alcools, des courses et des jeux, to cancel the Contest and conduct the selection process described above among eligible Entries previously received until the prize has been awarded. The Sponsor or their Agency is not responsible for typographical or other errors in the offer or administration of this Contest, including but not limited to errors in advertising materials, the Official Rules, the selection and announcement of the Prize Winners or the distribution of the Prizes. For Québec residents: Any litigation respecting the conduct or organization of a publicity contest may be submitted to the Régie des alcools, des courses et des jeux for a ruling. Any litigation respecting the awarding of a prize may be submitted to the Régie des alcools, des courses et des jeux only for the purpose of helping the parties reach a settlement. to win a home renovation!